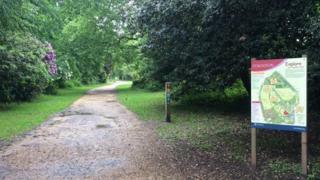 A 16-year-old girl has been sexually assaulted in a park in Havant. Hampshire Police said the girl was attacked in Leigh Park Gardens at about 16:30 BST on Sunday. A 16-year-old boy from Havant was arrested in connection with a serious sexual assault, police said. He has since been released under investigation. The park is on the site of a former stately home near the Leigh Park housing estate.